Depending on how you look at it, watering techniques could fall into 1 of 2 methods: gravity watering and capillary watering. 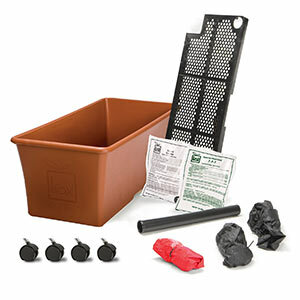 Each has its place in gardening and both methods can be used with great success. Rainfall! A wonderful delivery system for transporting water thousands of miles before gravity finally pulls in downward and onto our thirsty garden plants. 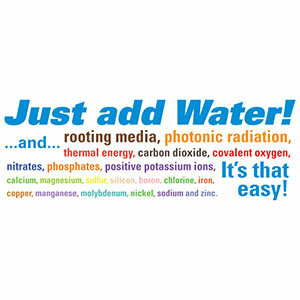 GRAVITY WATERING: results from water that is applied above the surface or soil line. Depending on its structure and density, the soil will have a certain amount of air pockets or space between the particles. As gravity pulls water downward it travels between those gaps and saturates the soil. Different soils can retain varying amounts of water. The remaining water is held in place due to cohesion and adhesion. Cohesion describes the tendency for water molecules to cling to each other. Adhesion is what causes those molecules to cling to other particles (like the soil). Just as rainfall penetrates the ground from above, there are plenty of artificial systems that achieve the same effect. Drip irrigation, sprinkler systems and canister watering also rely on gravity to pull water downward toward plants roots. Capillary watering is a secondary approach or mindset to watering your plants. This type of watering can work wonders for indoor house plants and annual garden vegetables. CAPILLARY WATERING: involves sub-irrigation or other systems that rely on wicking action. Soil can actually be moistened without being watered from the top. This is achieved through capillary action. Water slowly rises upwards despite gravitational force. The molecules cling to soil particles and climb through tiny air chambers rising all the way to the soil line. The ability of water to rise vertically in this fashion can be observed in nature and we can imitate it by design. What happens to gravity water that falls in the form of rain? Some of it runs off, flowing into streams and rivers. But some water seeps deeply -even beyond the reach of plants. Such water enters the water table. The water table is the place where water is stored in open pockets below the Earth's surface. These aquifers are the source of natural springs and wells. Some of that water even rises upward sustaining well rooted perennials. This basic behavior of water in soils can sustain trees during drought. And as a gardener, you can mimic this system for you own plants. Self-watering containers are a perfect example of this. 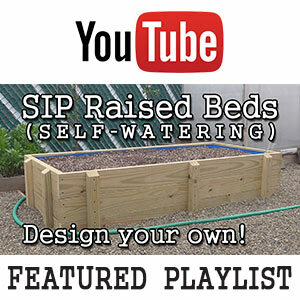 See SIPs for help with constructing a sub-irrigated planter.